Every now and then, we come across a deal that promises the world but eventually fails to meet our expectations. But, there are usually tell-tale signs that most of us tend to overlook. The end result is never pretty and we end up feeling cheated, frustrated or worse. This is probably what a lot of fellow travelers are going through as they realize that the secret Avis code floating around on SlickDeals, FatWallet and countless other websites is not going to work! 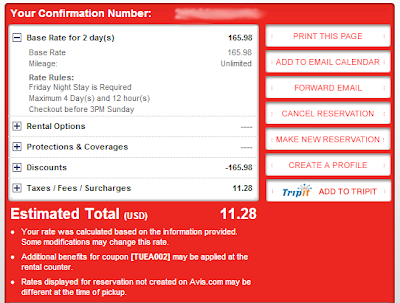 Avis is offering TWO free rental days with the coupon code TUEA002. We looked around, googled, read the coupon details and everything seemed normal. We were even able to book a Full-size car for just two days (not the usual 3-day min rental day requirement) with the magical two free day coupon code for a total of just $11.28. BAM!!! Now that looks like a real deal. While it's pretty common for rental car companies to offer coupons for free rental days, they're mostly for ONE free rental day and are applicable only when you rent for the weekend or the entire week. 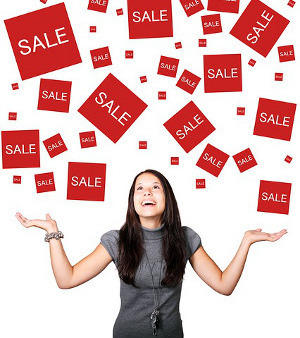 Check out the current deals on weekly and weekend rentals and score a free rental day! A tell-tale sign of a problem was that it was offering TWO free rental days. While this sounds like a fabulous offer, it's definitely not the norm and suggests that there's probably more to it than meets the eye. Apart from the $11.28 2-day rental that we scored, some people were able to book a vehicle for free! Avis may well be a multi-billion dollar business, but even they won't last long if they start handing out free rental cars to everyone. That got us thinking that there's probably a clause or a stipulation that we didn't pay attention to, but no matter how hard we looked around, there were no signs. Maybe it was a technical glitch in their system. 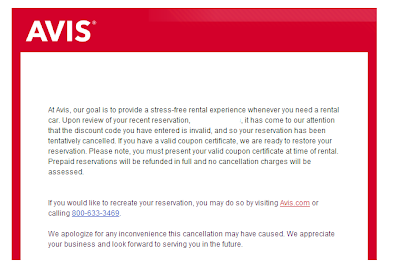 Avis says "you were never invited to the party"
With the steady stream of free rental reservations flowing into their systems, someone at Avis must have realized that something is not right. After a day of spreading like wildfire across numerous blogs and internet forums, Avis blocked the coupon and the ones who tried were greeted with this message. A lot of people were pissed that they were late to the party and missed out on a spectacular deal. The ones who had already booked were now wondering if Avis will honor the reservation, especially considering that the airlines usually honor mistake fares. The party ended for them soon enough. 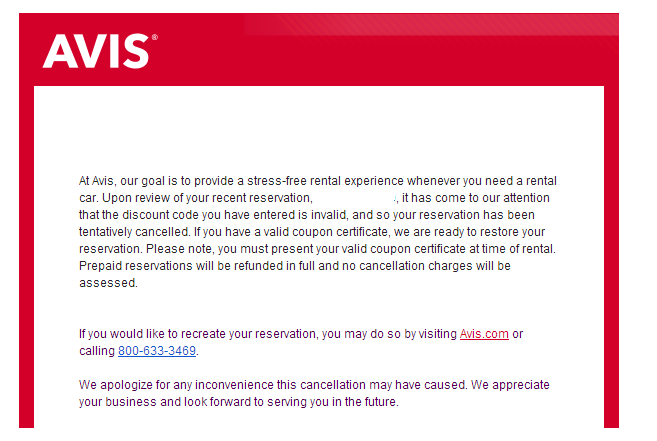 Later that evening, Avis sent out cancellation email to all party crashers. Turns out the coupon was only for Amex Platinum members and it even required a paper certificate (mailed out to select Amex Platinum card holders) to be presented at the rental counter for the discount to apply. Rental car companies, YOU can fix this problem! Rental car companies have relationships with all sorts of businesses - universities, government, military, clubs, groups, associations - you name it. They assign unique codes (called contract rate code) that can be used by members / employees of these organizations to get a negotiated rate / discount on rental cars. While these codes are meant to be private, some people leak these codes out to the internet and send innocent travelers on a wild goose chase. Discount code for Avis Platinum Members Only. Paper coupon required. "If it seems too good to be true it probably is"